Cumulative upkeep-Pay 2 life. 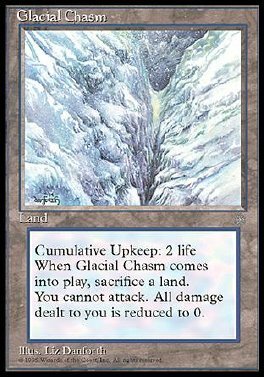 If Glacial Chasm would come into play, sacrifice a land instead. If you do, put Glacial Chasm into play. If you don't, put it into its owner's graveyard. Skip your combat phase. Prevent all damage that would be dealt to you.